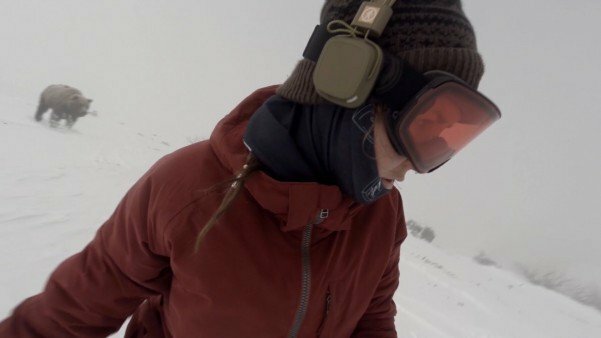 A video of a snowboarding girl unknowingly being chased by a grizzly bear in Japan has become the latest viral Internet sensation garnering close to 2.5 million views, but is it real? The video shows a girl snowboarding reportedly in Hakuba 47 in Japan. She’s listening to headphones and filming herself selfie video style as she cuts down the mountain. But unknown to her there is a giant grizzly bear hot on her trail who seems awfully determined to catch the poor girl. It’s only when she reviewed the footage that she realized how close she became to being lunch. “OMG! I was going through my snowboarding videos and I found a bear chasing me!!! I nearly got eaten!! !” says the description to the video uploaded by Kelly Murphy. Incredible footage indeed, but is it authentic? The diligent inspectors at Snopes.com have analyzed the footage and have some doubts. “For one thing, the audio is unrealistic. The bear’s intermittent (and ominous) growl appears to be at the same volume regardless of its distance from the snowboarder,” according to the article. The author also draws attention to what appears to be a computer-generated animal, but since the bear only appears for a few seconds it’s difficult to tell. A similar video of mountain bikers being chased by a grizzly bear was also found to be fake. In addition, it’s pointed out that brown bears are extremely rare in this part of Japan. More likely would be an Asiatic black bear.